Many air forces use the MiG-21 over the World. So still some models were made as also penty of after market decals were available in the "collection". 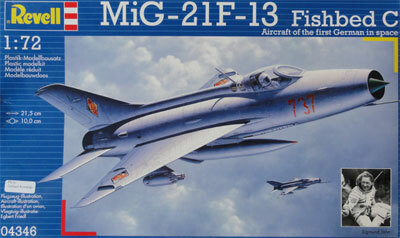 I bought another 3 kits of the fine Revell MiG-21 F13 kit #04346 as described on page 2. 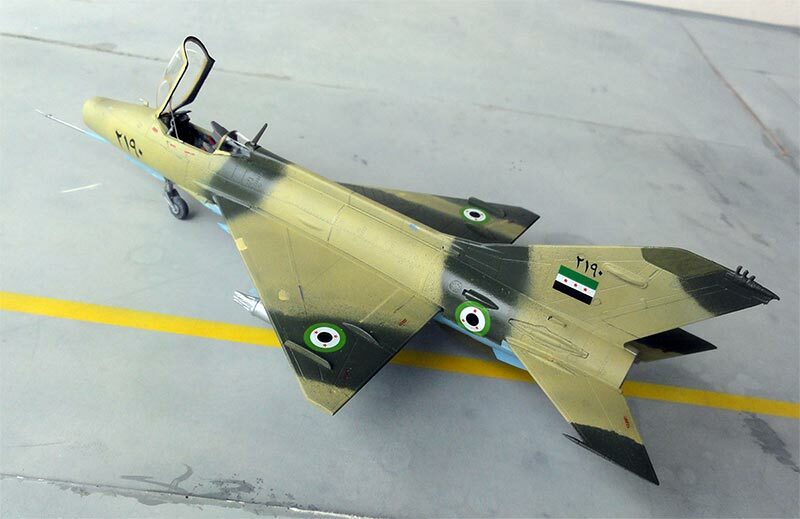 The first kit as to be made as a MiG-21 F13 operated by the Syria Air Force. Earlier in 1967 no. 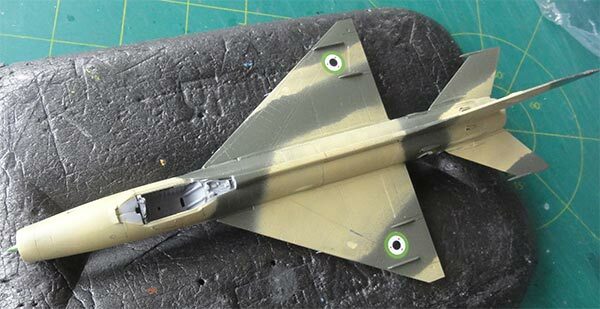 10 squadron based at Dmeyr was involved in the Six Day War with Israel flying MiG-17 and MiG-21 F13's still painted in a metal scheme. A desert scheme was probably applied from 1969 and also the aircraft type flown by no. 67 fighter squadron. (it may be that this particular aircraft is an Aero S-106 as several were delivered in the early 1970s from Czechoslovakia). Between colour airbrushing masking was done by helding a piece of torn carton. This gives a soft demarcation edge. The antenna areas were painted green including the inside radome cone. Some drawings found suggested that the rear canopy portion was over painted but I did not see this on most photos. The markings came from a variety of sources. The "United Arab Air Force" markings with "3 stars" such as the roundels of approx. 8 mm diameter were found in an Aztec "Sky guardian" 72-052 set and the UAR flags in a Berna MiG-17 decal set. (the old decals seen in the photo were thus not used). There are also a few different antennas, made from scrap. Armament was fitted with the rocket pods as per kit and the central fuel tanks was also fitted. A bit weathering was done with thinned dark brown paint applied in the recesses of flaps, brakes with a fine brush. With a pencil some panellines were suggested. Finally the model got a matt varnish coat airbrushing Johnson Future / Pledge with some 10% mixed in Tamiya X-21 Flat Base. This gives an even matt "desert" sheen and protects the decals. The canopy was set open and the cockpit interior got some bits and pieces to look "busy". 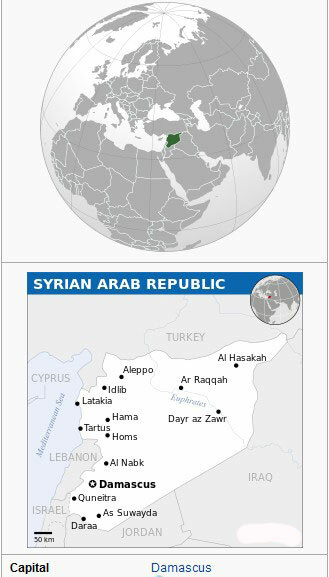 Syria as republic was established in 1930 and was also referred to as "Levant". The air force "القوات الجوية العربية السورية‎, Al Quwwat al-Jawwiyah al Arabiya as-Suriya" was established in 1948 in the period that France and Great Britain withdraw from the region (and the state of Israel established). North American T-6 were used and soon various armed conflicts in the region involved Syria, including the war in 1948. Some Spitfires and Chipmunks were acquired from Britain followed much later due to an arms embargo in 1956 by ex-RAF Meteors. Meanwhile from 1955 Czechoslovakia supplied for training in Egypt nearly 25 MiG-15bis "Aero S-103" jet fighters and UTI trainers. The Suez crisis of 1956 led to the destruction of many of these aircraft based in Egypt. Beginning 1957 saw the delivery of some 60 MiG-17F including some 20 PF with radar (also from DDR and Poland) and also a dozen IL-28 bombers were delivered. February 1958 it was decided to create a joined "United Arab Republic" with Egypt with a single joint UAR air force. Many Syrian aircraft were based in Egypt at the time and it appears also small numbers of supersonic MiG-19 were obtained and flown in Egypt. Some 36 MiG-21 F13 and 4 MiG-21U trainers were acquired with deliveries starting in 1963. They were based at Dmeyr north east of Damascus with the MiG-17's mostly based at Almezzeh. A coup d'etat in 1961 saw the UAR disbanded with years of unrest and in 1963 the Ba'ath Party with the al-Assad family taking over power in the country. In June 1967 during the Six Day war with Israel air strikes were flown and heavy losses incurred. The following years additional MiGs were acquired from Poland with from 1969 the MiG-15 "Lim-1" and CS-102 as well as some 60 Sukhoi SU-7 Fitters. From Czechoslovakia some 12 Aero S-106 (license MiG-21 F13) in the 1970s as well as 10 from Hungary and 4 from Iraq were acquired. 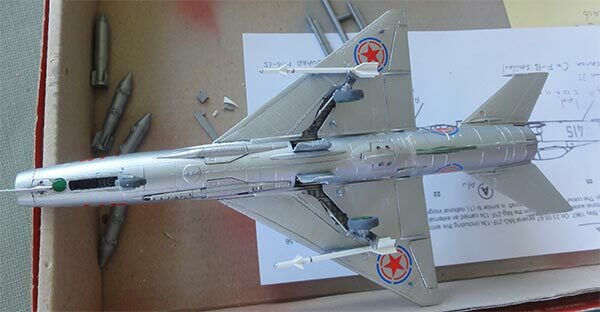 From 1970 the first MiG-21M / MF were delivered by the USSR flying also in the Yom Kippur war with great losses and in the following years probably more than 75 were added including a few MiG-21R. From 1973 about 40 SU-20 Fitter-C were acquired and also the first MiG-23 aircraft arrived and later also MiG-25 interceptors and probably some 40 SU-22 Fitter-K strike aircraft with more than 150 aircraft in total. Also some 50 Gazelle helicopters were delivered from France. Transport aircraft are the usual Antonovs and smaller Ilyushins but also the larger IL-76 Candid transport. In the 1980s also nearly an additional 200 MiG-21bis were also delivered by the USSR including MiG-21U trainers. From 1987 considerable numbers of MiG-29 (about 80) and SU-24 Fencers (some 20) from the Soviet Union arrived as well but not the full order as the USSR stopped cooperation in 1988. All those years the Syrian Air Force had hundreds of combat aircraft. It seems that not earlier than 2008 more aircraft were acquired, with Belarus delivering (second hand) 28 MiG-23MLD and 5 MiG-23UB. Over 60 Aero L-39 trainer/attack aircraft were also acquired and it is probable that MiG deliveries continued with eventually over 40 MiG-29, some 40 MiG-25 being delivered. A small naval division at Latakia operates Kamov and Mi-14 helicopters and the army flies large amounts of Mil Mi-8 and Mi-24 Hind attack helicopters. The internal Syrian civil war starting around 2011 with geo-political interventions have almost devastated the country and population. The regime flies its aircraft in considerable numbers with also border incidents. Still as of today, there is a large crisis and Russia flies its own Sukhoi SU-24 Fencer and probably Sukhoi SU-30 Flanker aircraft in the region from Syrian bases. It is probable that this particular aircraft is an "Aero S-106" as several were delivered in the early 1970s from Czechoslovakia and flown by no. 67 squadron. 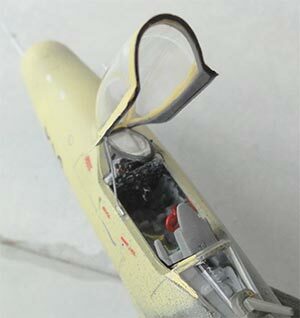 The second Revell F13 kit was made as a Communist North Korea aircraft is a dull metal scheme. 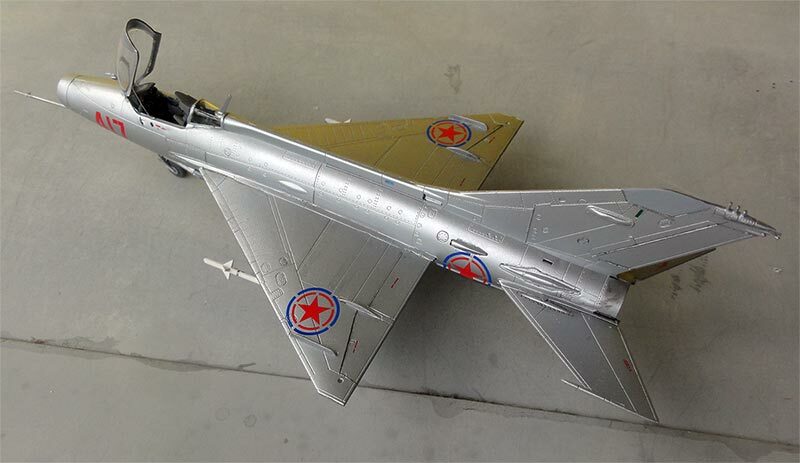 North Korea received from the Soviet Union several MiG-21 F13 from 1967. They could be armed with FFAR UB-16-57 rocket pods as well and in the beginning these aircraft were probably flown by Chinese pilots. The model colour is an overall metal for which Revell aqua 99 aluminium acrylic was airbrushed. It looks a bit dull as on the actual aircraft. The nose cone tip was painted green and the other antenna panels medium grey. 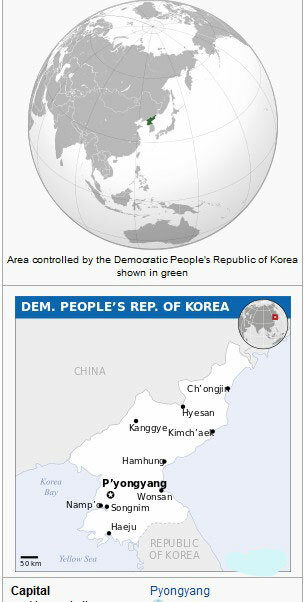 The North Korean roundel is "without the white background". These roundels were retrieved from an Eduard MiG-15 kit and have a diameter of 9 - 10 mm. 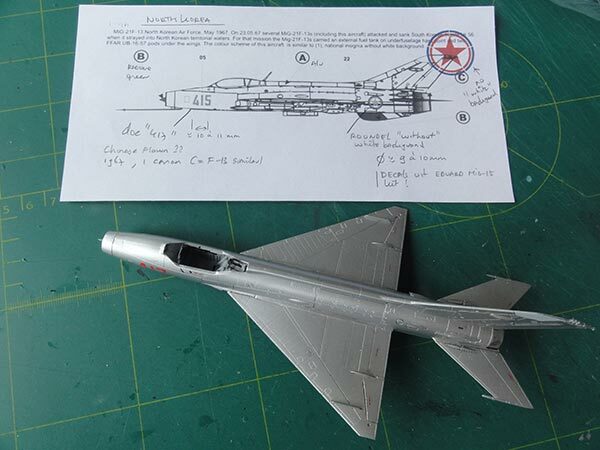 The RED 417 aircraft nose code was found in the spare decal box. A few "ATOLL" air-to-air missiles were installed as well found in the spares box. The canopy was set open, tilted up forward, a very special characteristic of this early MiG-21 F13. Delivery of the MiG-21 fighter started with probably from 1966 some 80 MiG-21 F13 though some reported the first arrived in 1963. It is probable also about 100 MiG-21PFM followed from 1969. In the 1970s and 1980s this fleet was kept operational with much difficulties.